Rubber Roller Manufacturer, Exporter and Supplier from India, we have been manufacturing all types of Rubber Rollers. 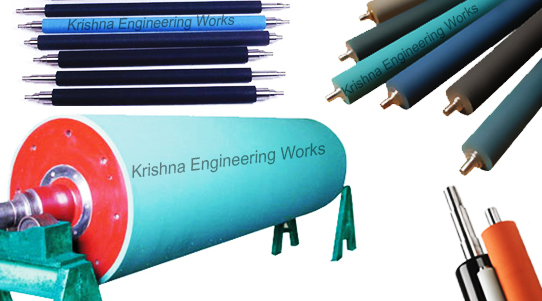 Rubber Roller with different types for various Industries. Brush Rollers, Super Hard Rubber Rollers, Inflatable Rubber Tube, Nip Roll, Pinch Rollers, Printing Rollers, Impression Rollers, Silicon Rollers, EPDM Roller. Krishna Engineering Works makes international standards of Rubber Rollers, also awarded for best quality products. 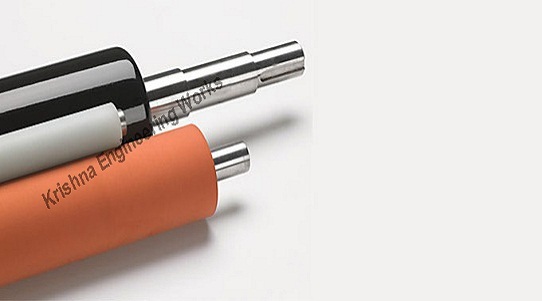 Rubber Rolls available for all kind of applications and various types of rubber coated rollers. Also, dealing with high-quality fabrication, re-covering rubber roll, precision rollers, textile rubber roller, printing rollers and industrial rubber roller from last 25 years. We have been lively manufacturing and engaged in serving various industries from last 25 years for supplying Rubber Roller like, Packaging, Converting, Plastic, Textile, Foil, Paper, Lamination, Metal, Leather and many more. Also, we are leading Winding Rewinding Machine Manufacturer, Slitter Rewinder Machine, Doctoring Rewinding Machine for flexible packaging industries. The performance of Rubber Expander Roll (Bow Roller) depends upon Lead in – lead out distance, Wrap angle, Position of the bow (adjustable). 3: 1 lead in – lead out ratio is considered to be best. However, lead out distance preferably should not be more than 3 times of expander roller diameter. The best results are achieved when the bow roll is perpendicular to the web direction. The Rubber Rolls is fitted with cam mechanism fitted with on bearings with left & Right slats from the center. For longer width, three slats are fitted and middle slats are fixed to avoid V-shaped wrinkle-removing action.